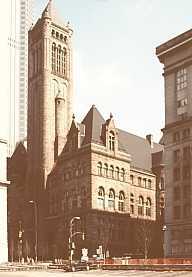 The Allegheny County Courthouse and Jail of Pittsburgh, Pennsylvania; and two Texas courthouses. Henry Hobson Richardson died in 1886 - before his massive two part work in Pittsburgh was completed. The courthouse is complete with a generous courtyard and a "matching" jail - connected to the courthouse by a replica of Venice's Bridge of Sighs." The jail had generous quarters for a warden and a large central octagonal tower. "Richardson's great epitaph of a place." The January / February 2001 issue of Preservation Magazine featured an article called Jailhouse Conversion by Allen Freeman. The article covers three topics - the recent $34 million conversion of the former jail into a [Family Law] courthouse, a 1902 scandal in which the jail warden's wife (Kate Sofffel) helped two inmates (The Biddle Brothers) escape death row and some background and details of Richardson's career. What made this escape truly scandalous was the fact that Mrs. Soffel not only helped the brothers escape - but she "escaped" with them. The incident was made into a 1984 movie with Diane Keaton playing the title role of Mrs. Soffel. Mel Gibson played the more seductive of the brothers. We don't know how the movie ended, but in real life all three were shot - the brothers mortally. Mrs. Soffel survived her wounds and served time in (another) prison before dying in 1910. Richardson, who was understandably proud of his "twin" buildings in Pittsburgh died at age 47 of Bright's Disease - after a career of only 20 years. Allen Freeman calls the jail building "Richardson's great epitaph of a place." Richardson's work was admired by architects all over the U. S. and at least two in Texas were impressed enough to flatter Richardson with striking (but smaller) imitations. DeWitt and Lavaca Counties are Central Texas neighbors and the construction of their courthouses both in the same year of 1897 may have been coincidence (since county rivalry in Texas is unknown and non-existent). It's interesting to note that these two counties are between Gonzales and Victoria Counties - who both have Richardsonian Courthouses of their own. The dates are Victoria 1892 and Gonzales 1894. Both were designed by J. Riely Gordon. Gonzales' Jail was designed by E. Heiner, Architect of the Lavaca County Courthouse. The Lavaca County Courthouse was built on land donated by the heirs of Mary Hallett. 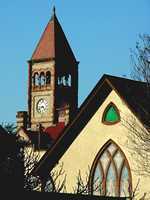 After a colorful fight with a rival town (the now defunct town of Petersburg) Hallettsville became the county seat in 1852. The previous Hallettsville courthouse was sold at auction and dismantled in 1897 to make room for the new one. The $80,000 cost of the new courthouse was financed by bonds. The contract was let in June 1897 to Eugene T. Heiner of Houston who at one point is said to have had his wages garnished to pay creditors. He fared better than A. O. Watson did in DeWitt County - since Watson is said to have been driven into bankruptcy. 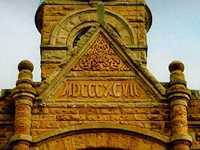 The official dedication of the building was July 4th 1899 although the cornerstone and decorative emblems show the date 1897. 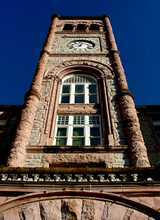 The height is 170 feet and the clock faces are seven feet across. 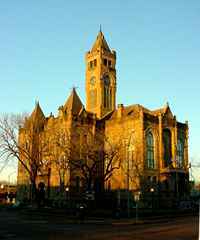 Like the DeWitt County Courthouse in Cuero - the building strongly resembles the Allegheny County Courthouse building in Pittsburg, Pennsylvania - widely regarded as the archetype of Richardsonian architecture. Note: Since La Grange declined the honor of having the film version of "The Best Little Whorehouse in Texas" filmed on location in La Grange, the people of Hallettsville volunteered their town for the courthouse sequences. The DeWitt County Courthouse is said to have driven architect A. O. Watson into bankruptcy. 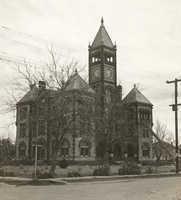 Watson also helped design the Llano County Courthouse in 1892. This sturdy and stately Richardsonian building sits on an entire city block. Although the expansive lawn is square, the courthouse faces residences and not the standard commercial buildings that usually surround a courthouse. The lobby of the DeWitt County Courthouse courthouse has a good display of photographs - much of it involving courthouse history.